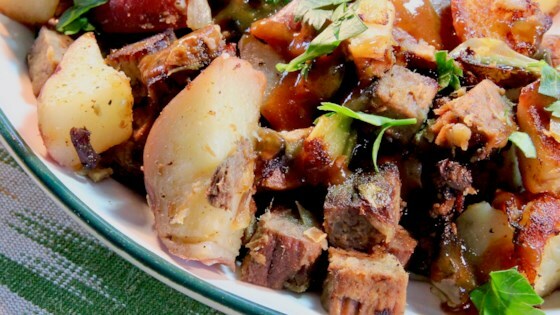 "Our family always has leftover roast beef and this recipe is a great way to finish it up!" Place potatoes on a microwave-safe plate and prick skins with a fork. Cook in the microwave until slightly tender, 7 to 8 minutes. Cut into 1-inch cubes. Combine potatoes, roast beef, onion, green bell pepper, and mushrooms in a bowl. Preheat an electric skillet to 350 degrees F (175 degrees C). Coat with oil. Spread potato mixture evenly in the skillet. Let cook, without stirring, until browned, about 5 minutes. Flip and continue cooking until second side is crisp, about 5 minutes more. See how to make corned beef hash with the perfect crispy crust. I just bought a bag of diced potatoes and added the other ingredients. Perfect! Needs a little salt and pepper. Otherwise very good.